This past week was spring break and because I don’t have a real job I was able to take my girls up to visit my family in north Texas. We decided not to take I-35 and instead took the backroads so that we could pass by Lake Brownwood State Park. As state parks go the landscape there wasn’t the most spectacular but the buildings are. Built by the Civilian Conservation Corps during the Great Depression, Lake Brownwood has an impressive Group Recreation Hall and a grand staircase that early visitors would use when they arrived at the park by boat. The cabins were also nice; especially cabin #9 where we stayed. I’m sure many families have made many happy memories there and I’m glad we went a little out of our way to see the CCC. As I mentioned in the previous post the crew of Apollo 8 experienced a number of “firsts” on their December 1968 flight to the moon. First and foremost they were the first men to leave Earth’s orbit. As they made their way towards the moon they were for the first time able to see all of the earth at once. They photographed this but the far more well-known image from their flight was taken once they were in orbit around the moon. I wrote a post about this back in 2013 and in it I referenced a video (which is still worth watching) where NASA created an animation that combines the existing voice recording of the astronauts overlaid with the images they took to recreate the somewhat frantic moments that proceeded the creation of this famous "Earthrise" image. Frank Borman was in the process of executing a roll of the spacecraft when Bill Anders, who was surveying the Lunar surface for potential landing sites, happened to see the Earth beginning to rise out of his window. He snaps a shot of it with the camera he has, but realizing its loaded with black and white film, he calls out to the third member of the crew, Jim Lovell, to grab a canister containing color film. As the spacecraft continues to roll, the view disappears out of the small window Anders is using before Lovell can retrieve the color film. All three of them think they've missed the shot when the Earth comes into view out of another window. It is through the round window of the spacecraft's hatch that the iconic image is ultimately taken. The fact that the photo exists at all is incredible: the spacecraft just happened to be pointing at the exact right place at the exact right time. It’s also incredible that this amazing technical achievement occurred over a half-century ago. We as a nation (and as a people) have enormous potential to do great things when we work together. It’s something worth remembering. Fifty years ago, at 7:51 in the morning Apollo 8 launched into space from the eastern Florida coast. After orbiting the earth twice it restarted its third stage engine which set it on a course for the moon. Everyone knows about Apollo 11’s historic landing on the moon that occurred some seven months later but in many ways Apollo 8 was just as remarkable of a flight. It was the first manned test of the Saturn V rocket, the largest and arguably most complex vehicle ever built. It was the first time men would leave the orbit of the earth and travel to another heavenly body. It was the first time man had first looked upon the far side of the moon with their own eyes. It was the first time man would look back and see the Earth in its entirety. We’ll touch on all of that in the coming days but in the meantime it is worth remembering that there was a time in our nation’s history that we were willing to build spaceships to go other worlds rather than walls to keep out our neighbors. Sears declared bankruptcy this week. I couldn’t tell you the last I actually stepped inside of a Sears store and so this news will not impact me much at all. Of course, I have fond memories of the arrival of the Sears “Wish Book”. When I was a kid it would arrive just before my birthday and in the days before the internet it contained all manner of material desires that a child could want. But if flipping through the toy section of the catalog was a virtual experience few things could compete with the actual experience of going to physical a toy store. Although the demise of Sears may be a larger milestone given its place in American culture (and its not-insignificant role in skirting around the injustices of the Jim Crow era), it is was the closing of the last Toys “R” Us stores this summer that had more of an emotional impact on me. I remember fondly going to the one in the Arlington of my youth. I remember the excitement of finding a new LEGO set or Star Wars figure. The anticipation I felt walking through those doors was something I have seldom experienced since. Of course I took the girls to Toys “R” Us a few times here in San Antonio but somehow it was less of an adventure for them. The overabundance of choice offered at all times by the internet somehow lessened the singular experience of visiting a toy store. Apparently it lessened the profitability of a toy store as well. The role of the physical world is changing. It can still be (and should be) a source of excitement and wonder but the ends it serves will be different than it once was. I haven’t figured out what that difference will be yet, but I’m working on it. Along with other members of my profession I was saddened last week to hear of the passing of Robert Venturi. Although I never met him in person, he has traveled with me throughout my career. I was first introduced to Mr. Venturi via his wife and collaborator, Denise Scott Brown. I read the book they wrote together with Steven Izenour, Learning From Las Vegas, as a young undergraduate architecture student. The book provided analytical tools that helped me understand the sort of messy suburban landscapes that surrounded me in Texas. It also taught me that if I kept my mind and my eyes open I could learn from any built environment. This is how I came to be interested in courthouses and small town urbanism. My relationship to Venturi’s earlier book, Complexity and Contradiction in Architecture was, well, complex and contradictory. Even though it was one of the first works of architectural theory I read it was remarkably accessible. Unlike the writing of other architects, Venturi’s prose was both clear and persuasive and it served as an example I have always sought to match in my own writing. Of course I was reading Complexity and Contradiction a good three decades after it was originally published. Ideas that were radical in 1967 were somewhat less so in 1997 after postmodernism (a term Venturi disliked) was rapidly falling out of favor. I remember arriving at the end of the book excited by the ideas it contained and then being underwhelmed by the built work Venturi cited as examples. Complexity and Contradiction was an expansion of Venturi’s Master of Fine Arts Thesis he completed at Princeton in 1950. It loomed large over me when I attended Princeton myself as a graduate student and was tasked with creating a thesis of my own. Just like Mark Twain hated Benjamin Franklin for providing an example that was a bit too perfect for a young boy to follow, I came to resent Robert Venturi for writing a thesis that was a bit too perfect for an architecture student to emulate. Venturi’s thesis perfectly reflected Princeton’s legacy of integrating history and theory while defining the direction of Venturi’s work for the rest of his career. It was, in short, the plutonic ideal of what an architectural thesis should be. That was a high bar for a student to clear and in trying to do the same I failed spectacularly. Studying at Princeton put me in close proximity to many of the projects Venturi’s had built along with John Rauch and Denise Scott Brown. His 1980 Gordon Wu Hall on Princeton’s campus happened to be the closest dining hall to the College of Architecture. The building’s exterior made the same playful contextual references Venturi’s work was known for but it was the interior that fascinated me. It was warm and inviting. It felt good to eat there even if I was sitting by myself surrounded by young and care-free undergraduates. Venturi would later travel with me to Italy on my honeymoon. When my wife (who like Denise Scott Brown is also an architect) arrived in Rome we carried a long list of buildings we hoped to visit. Even so I distinctly remember wandering into a piazza not on the list and thinking, “I know this place.” I recognized it because Venturi had referenced it in one of his books. Back in Texas Venturi’s footprint was relatively small. Built in 1992, the Children’s Museum of Houston features playful reinterpretations of the elements that define typical “serious” museums. A decade earlier Venturi, Rauch and Scott Brown had designed an art museum for Austin that, had it been built, would have changed the cultural and architectural landscape of that city for the better. I always appreciated the fact that Venturi had a sense of humor about his work. I also respected the fact that he could admit when he was wrong. In the original text of Complexity and Contradiction he disparaged the a church outside of Florence. Venturi later added a footnote where he admitted that after actually visiting the church in person it was in fact a beautiful and effective building. Venturi famously responded to Mies van der Rohe’s “Less is more” credo by saying “Less is a bore.” After all these years I can certainly say traveling with him has never been boring. The fierce ongoing debate about the redesign of Alamo Plaza speaks to how critically important the project is for our city. It also happens to be a fascinating design problem. Back in 2013 Margaret Sledge and I decided the challenge of Alamo Plaza was worth studying in the context of a hypothetical design studio at Trinity University. Our students came up with a variety of different design proposals but the one produced by Nate Adams, Jason Azar and Keegan Droxler was particularly memorable. They called for converting the existing historic commercial buildings on the west side of the plaza into a museum / visitor center for the Alamo. At the time this struck me as a particularly good idea and I was pleased when, five years later, the authors of the “Alamo Comprehensive Interpretive Plan” had the same idea for the location for the visitor’s center. I was less pleased when I saw they were considering demolishing the historic structures located there in order to build a new museum from the ground up. As I sat through one of last week’s public discussions / yelling matches I started thinking about how the limitations of the three historic buildings that form the western edge of Alamo Plaza could be turned into assets in order to create a world class visitor center. In my spare time this past week I took the seed of what Nate, Jason, and Keegan had started in class five years ago and developed it into something I think is worth sharing. Of course stealing the ideas of former students is only one of many transgressions I committed. Second guessing a design team who is still very much in the process of designing is also something you’re not supposed to do. Then again, there has been a lot of commenting / second guessing going on since the Comprehensive Interpretive Plan was released. Rather than just react to the what I saw with words I could actually do some design work. And so for better or worse that is what I have done. 1. I am not an expert on the Alamo - I’d like to think I’m reasonably knowledgable of Texas History and as an architect I do spend most of my waking hours thinking about the built environment. I also spent the better part of a decade living and working within a few blocks of the Alamo so I first hand knowledge of the challenges and possibilities of Alamo Plaza. 2. My particular ancestry does not privilege my opinion - Although I can claim to be a 6th generation Texan whose ancestors played a part in the Texas Revolution, that does not bestow on me any particular claim on the Alamo, it’s past or its future. I do, however, believe that whether you’re a descendent of William Travis or a singer / songwriter from east London, the Alamo and its story belongs to all of us. 3. I have no connection to the Alamo Master Plan Design Team - The group of professionals assembled by the Alamo Master Plan Management Committee is credentialed, talented and I have no doubt they have the ability to produce good work. But a design team’s potential is circumscribed by the demands placed upon them by the client. Those constraints do not apply to me and so I am free to propose things the real designers cannot. So again, just to be clear, this is an unsolicited, unsanctioned, purely hypothetical design proposal for a visitor center that could be built but - but probably won’t. As identified by the Comprehensive Interpretive Plan (and my undergraduate students), the Crockett Block, the Plaza Building and the Woolworth Building that form the western edge of the plaza are an ideal location for an interpretive museum / visitor’s center for the Alamo. Adaptively reusing these structures - which are themselves historic - to create such a facility makes plenty of sense: the buildings already exist and the location is ideal. To be sure there are issues associated with reusing these structures but I think it’s possible to view these challenges as opportunities to create a design solution that is uniquely suited to the Alamo. It is true that the Crockett Block, the Plaza Building and the Woolworth Building all sit on a portion of the Alamo’s former perimeter wall. The Hotel Gibbs and Federal Building do so as well but in the case of the commercial buildings in question the non-historic portion of their interiors could be gutted to open up the street level so that a portion of the Alamo’s original perimeter wall could be rebuilt in place as an interpretive exhibit. Visitors to the museum could walk through full-size dioramas that recreate the days before, during and after the 1836 siege. These reconstructions would also be visible through the buildings’ first story windows, creating a visual connection between the existing “real” Alamo Plaza outside and the historic simulation inside. One of the reasons given for tearing down the Crockett Block and its neighbors is that the current buildings are not large enough to accommodate a suitable visitor center. If additional space is indeed required, gallery space could be built above the original structures. In order to preserve the oldest (and arguably most important) of the three buildings on the block, this addition could be built to cantilever over the 1882 Crockett Block. A side effect of these structural gymnastics is that this cantilevered addition would cast shade onto an outdoor viewing terrace located on top of the Crockett Block. As well as serving as an ideal place to experience Alamo Plaza from an entirety new perspective, this terrace could also become a premiere location for special events that could be held independent of the public plaza below. If the view from the Crockett Block's new viewing terrace is impressive the view form the Floating Gallery above it would be stunning. Floor-to-ceiling glazing would bathe the galleries in light while allowing Alamo artifacts to be seen within view of the historic Alamo itself. A series of partitions could create darker galleries for the display of more light-sensitive items. Of course the Visitor’s Center is but one of many aspects of the Comprehensive Interpretive Plan. There are plenty of compelling ideas in that plan and of course there are also some that are less so. It is my sincere hope that this modest proposal adds something to the ongoing discussion of what to do with Alamo Plaza. Just as I used my student's project as a starting point I hope the "real" design team can use this effort as a starting point to create something worthy of the Alamo. Back when I was taking my exams to become a licensed architect the study materials always included a question about thin-shell structures. This is a very specialized type of concrete construction that derives its strength not from the thickness of the material but from its shape. One particularly efficient shape was the hyperbolic parabolid. The strict definition of a hyperbolic paraboloid is, "An infinite surface in three dimensions with hyperbolic and parabolic cross-sections". More simply it's a shape that looks like a saddle. I always thought it was a joke that the State of Texas thought it was important for architects practicing today to know about thin-shell concrete hyperbolic parabolids because even though they are cool, no one's building them anymore. Constructing the formwork for these complex shapes is incredibly labor intensive and the concrete’s strength can be compromised by small changes in temperature and humidity. Asking a question about them on the ARE exam would be like asking a question about Gothic groin vaults or Victorian mansard roofs. Pretty much the only person to have had any success building these things was a Mexican engineer by the name of Félix Candela. I had seen photos of his work in school and although I respected it I frankly never really thought all that much about it beyond that. Then I got to experience what it was like to be inside a thin-shell concrete hyperbolic parabolid. That made me think about them a lot more. I happened to attend a wedding at the Chapel Lomas de Cuernavaca, an open-air chapel located about 36 miles south of Mexico City. The wedding Mass was beautiful (even though I didn't understand a word of it as it was sonducted in Spanish) but it was the chapel that really grabbed my attention. And even though I could appreciate the structural efficiency of the structure's thin-shell I was really blown away by its architectural expressiveness. Even though the structure was only inch-and-a-half thick, it felt like I was enveloped within a cave. But it was a cave that somehow allowed light to penetrate deep inside. It was a cave whose shape directed prevailing breezes through it. It was a space that was difficult to capture with photographs and that may have been part of the appeal: the architectural experience proved to be difficult to describe. It was a space like no other. In all likelihood I will never design a thin-shell hyperbolic paraboloid structure. Of course, in all likelihood I’m not going to design a Victorian courthouse or a Gothic cathedral either. But just I am glad courthouses and cathedrals exist, so too am I glad that hyperbolic paraboloids exist. A couple of weeks ago I wrote a blog post about Mary Colter and the Desert View Watchtower. I talked about how great the building is and how much I could have learned simply by studying it rather than earning the degrees and working at the firms that I did. Although I still I stand by the basic thesis of that post (that the Desert View Watchtower is a really great building that has a lot to teach a young architect) a colleague of mine pointed out that the post was written from a place where the existence of choice was assumed: I could choose to go to architecture school, I could choose to work at the firms that I did or I could choose to do none of those things and instead hang out on the South Rim of the Grand Canyon. The reality is that not all people are afforded those same choices: Mary Colter certainly was not. Born in 1869 her life was closely circumscribed by the prevailing societal norms of the day. In the 1880s there was no real mechanism for a woman to receive formal training as an architect. Instead she went to art school and eventually "backed" her into to the profession. She was ultimately able to do the work she was able to do because of her amazing talent but also because she was fortunate to find a one-in-a-million patron in the form of Fred Harvey who had the resources and the open-mindedness to give her talent the freedom to flourish. Her career was exceptional not only because of the quality of the work it produced but also because it existed at all. 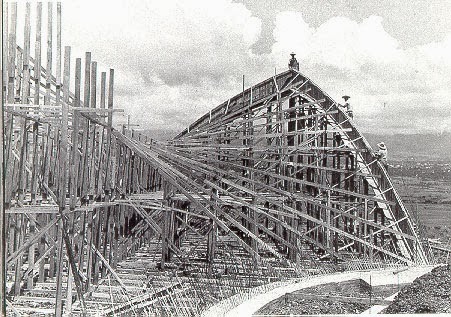 As a point of comparison, Frank Lloyd Wright was born just a couple of years before Colter in 1867. He had the freedom to go to architecture school (and to subsequently drop out). He had the freedom to work for Louis Sullivan, one of the leading architects of the day (and to later be fired by him). He had the freedom to choose clients and build the career he wanted for himself. These were all choices Colter simply did not have. Indeed they were choices the women who worked for Wright did not have. The goal here isn't to compare Colter and Wright in terms of talent or influence. Rather the point is that these two architects were given radically different opportunities based solely on weather or not they happened to be born with a Y chromosome. When hail hit San Antonio last year our neighborhood was in the direct line of fire. Pretty much every house around us has had its roof replaced in the last nine months. As Sammy and I walked to school every morning we would always see work being done. We saw workers install everything from standing seam metal roofs to asphalt shingles. Today over eighty percent of American roofs are covered with asphalt shingles. Asphalt shingles are manufactured to look like traditional wood shingles: individual sheets are varied and colored to simulate the appearance of their predecessor. The reason is clear: people like the look of wood shingles but asphalt shingles are less inexpensive, they're fireproof and they're quick and easy to install. Of course it wasn't always this way. When I grew up I lived in a neighborhood where all the houses had wood shingles. Over the last several decades these traditional wood shingle roofs were slowly replaced so that now it is remarkable when I come across one. This recently happened when I was hiking (again with Sammy) at Palmetto State Park. As we walked toward the park's historic Civilian Conservation Corps (CCC) picnic pavilion I noticed the wonderful depth and texture of these shingles (or rather these wood shakes - wood shingles are machine cut and regular whereas wood shakes are hand cut and more varied). 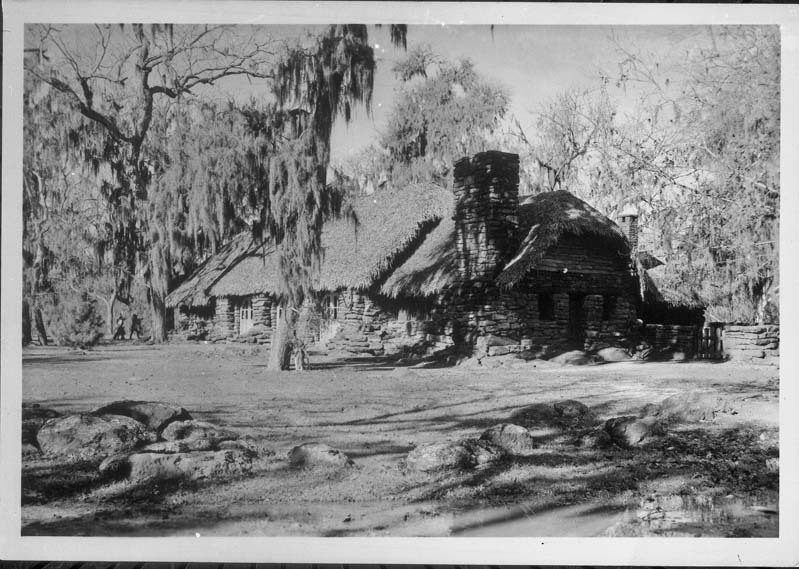 Of course the irony is that just as asphalt shingles replaced wood shingles on homes all over the country, the wood shakes at the pavilion at Palmetto State Park actually were themselves a replacement. The roof of the pavilion was originally covered in dried dwarf palmetto fronds - the type of plant that gives the park its name. Part of the ethos of the CCC was to use locally available materials as much as possible. It was the Great Depression and so while labor was cheap, materials were expensive. If you could cover the roof of your building with something that was literally laying around the forrest floor, all the better. The problem was that dried palm fronds need to be replaced often and are a bit of a fire hazard. The same could be said of wood shingles. It's not uncommon for one system to replace another over time but it's important to remember that something is often lost in the transition. It's much more convenient, for example, to be able to make a call from anywhere versus being tied to a land line, but the quality of the connection is almost always worse. It is much easier to communicate with someone via email, but the intimacy and physicality of a hand-written letter has been lost. Covering your roof with a tactile, natural material - be it wood strips or palm fronds - may be expensive and time-consuming, but somehow it feel better than draping blankets of asphalt over your roof like everyone else in your neighborhood.